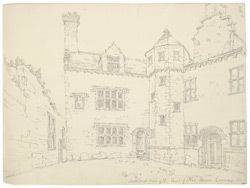 This drawing shows a south-west view of the court at Plas Mawr (Great Hall), the home of Robert Wynn. The house is a stunning example of Elizabethan architecture and reflects the great wealth and taste of its original resident. Wynn, who was previously a royal courtier and soldier before becoming a "merchant", was a colourful character. He travelled extensively through wealthy European society and readily absorbed a taste for the foreign designs and styles he encountered on his wanderings. When he built this house between 1576 and 1585, he innovatively combined traditional English Tudor interior design styles with those he became acquainted with in France, Italy and Germany.